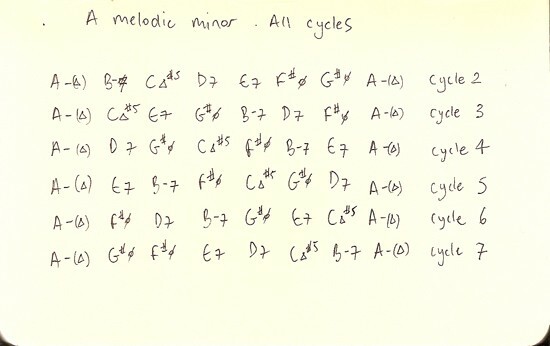 Here’s the harmonised A Melodic Minor scale arranged in various cycles. The last three are the reverse of the first three, but you knew that already because you were looking for patterns, eh? So, one interesting thing to do with this is to voice-lead it. Pick a voicing for the A-∆, say, 1 7 b3 5 (5 x 6 5 5 x), and move to the next chord with the least amount of movement. Do that for all the cycles. How many notes change/stay the same in each cycle? E.g., for Cycle 3 and 6, only one note changes when you move to the next chord. Crawl along the fretboard doing all the inversions. Think ahead to what the next chord in the cycle is.